Please check back for more information about American Apartment Management in News & Press. Ms. Garnet Kozielec, a resident of Dunbar Towers located in Dunbar, West Virginia, turned 100 years young on March 29, 2017. The tenant association held a birthday party in her honor with the mayor of Dunbar, along with other city and state officials in attendance. 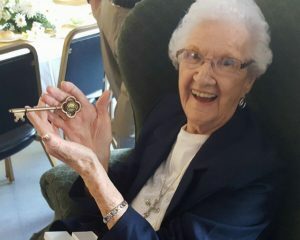 Ms. Kozielec was presented with a key to the city by the mayor. 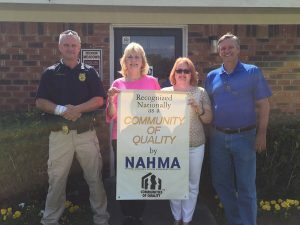 Decatur Meadows Apartments, a 44 unit family property located in Decatur, Mississippi and professionally managed by AAMCI, was awarded the National NAHMA “Community of Quality Award”. Pictured from left to right: Jody Pennington, Decatur Chief of Police, Sharon Johnson, Regional Property Manager, Pam Holmes, Community Manager and Pat O’Neill, Mayor of Decatur. The National Affordable Housing Management Association (NAHMA) announced its 2016 Affordable 100-a list of the 100 largest affordable multifamily property management companies ranked by affordable unit counts. American Apartment Management Company moved up in the rankings to 44th in 2016 from 58th in 2015. Alexandria,Va., May 29, 2015 — The National Affordable Housing Management Association (NAHMA) announces its 2015 Affordable 100—a list of the 100 largest affordable multifamily property management companies ranked by affordable unit counts—is available on its website at http://www.nahma.org/about/affordable-100/,as well as in the June issues of Affordable Housing Finance magazine and Units magazine. American Apartment Management ranked 58th moving up from 77th in 2014.